Horiatiko phyllo which is the Greek equivalent to Provençal Pastry is one of many types of phyllo used in Greek cuisine to make pastry. It makes a thicker phyllo than the usual one which is used to make “pittes” or pies. However, it is very easy to make on your own but if you live in Greece, you can also find it sold in all supermarkets. I first saw this recipe in a Greek T.V. show by Elias Mamalakis, where a Greek lady from Kythnos island was making Koukoulopites. I also saw this pastry at The Constanble’s Larder and loved it. I looked very easy, so immediately I wanted to try it. All you need is flour, oil or butter, eggs, salt and water. I loved the simplicity of this pastry dough and how easy it is to roll out, that I have been using it to make pies, ever since. I have doubled the dose as we are a large family and the second time I added some graviera cheese in the dough, making it extra tasty. In case graviera is not available where you live, I would substitute it with halloumi or any other cheese that does not melt, such kefalograviera, aged myzithra or pecorino. Some of these cheeses are very salty, so reduce the amount of salt. When I made it the second time, instead of using all purpose flour, I used bread flour, which I definitely prefer but I have also used whole wheat flour, which also makes a delicious crust. 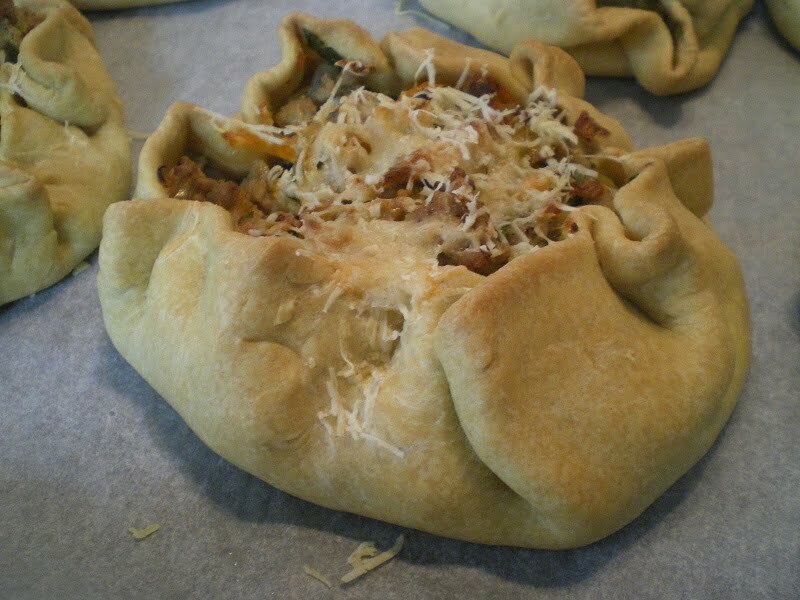 The first recipe I used this phyllo was to make a meat galette and a different meat galette with sausage. Then I made a Leek and Artichoke galette. A Chicken Galette and many more! You can watch the video where I make the chicken galette. You can also use it to make sweet galettes. Or any other fruit galette. Horiatiko phyllo which is the Greek equivalent to Provençal Pastry, is one of many types of phyllo used in Greek cuisine to make pastry. In a big bowl add flour, salt and olive oil and rub with your hands until all the oil is absorbed. Add the cheese, eggs, and mix. Add the water and mix until the dough does not stick on your hands or on the bowl. (Alternatively, the dough may be made in the mixer using the dough hook). Divide the dough into two pieces*, one of which should be slightly bigger, in order to cover the sides of the baking tin. Make two balls. Start from the bigger one, making sure to cover the other. Using a rolling pin try and shape the dough into a circle, rotating it each time. When the pastry sheet is bigger than your baking tin by an inch, it is ready. Brush a 28 cm baking tin with olive oil. Roll the pastry sheet on the rolling pin and bring it over your baking tin. Then carefully unfold the pastry sheet in your tin. You can easily stretch it by pulling it with your hands. Cut off any dough above the rim. Add the filling and cover with the second sheet, which should be the size of the baking tin. Take the two sheets of pastry and join them together by pressing the edges, trying to make a uniform pattern if possible. Brush the pastry sheet with olive oil, score into pieces and bake until golden brown. Divide the dough into 5 - 6 equal pieces, depending on the size you want to make the galettes. Roll out the phyllo dough. Put the filling in the centre, leaving 3 - 4 cm empty border, around the edges. Fold the border up over the filling, making sure to leave a hole over the filling so that the steam can escape. Place the galettes in a baking tray lined with parchment paper. Brush the crust with an egg wash and bake until golden. If using a non-stick mat, you do not need to flour the dough. Previous Post: « Yaaay, my account is back!!! I want to see a “kolokithopita”…my mother used to make hers with stafides (raisins) and it was a little sweet. I always think you are a master in making pastries. I wouls love to taste all of them. What delicious looking creations! An interesting pastry! I love everything you did! It all looks delicious! HonryB’s last blog post..Lions and Tigers and Bears…..and Dinosaur!? I want that cheese turnover! Chicken pie looks also tempting! Looks delicious, love your pastries! @ Peter: Peter, I also make kolokythopita with raisins and a little sweet. @ Happy Cook: Thank you Happy Cook. This pastry dough is so easy anyone can make it. & HoneyB: HoneyB, I nearly sent your message into spam as I interpreted your name into something else 🙂 Thank you very much. @ Angie: great choice Angie, but I am sure you will like some of the others as well. @ Rosabella: Yes, it is very easy to work with and there are many ways to use it. I shall start using it into sweet recipes without of course adding cheese to the dough, but may be a little sugar. @ Giff: I will be updating the post soon with many recipes. Wow, what an impressive array of dishes from one type of pastry! what a fantastic set! I’d love to see recipes for all of them, but in particular your meat galette and cheese and fennel pie! This is marvelous! I have a real problem with pastry dough and rolling it, and I will certainly try this. Can’t wait for the recipes…all of them looks so good…esp the turnovers. I’d like to see the fennel and cheese pie. Fennel is one of my favorite herbs… I love the licorice thing it has going on. This sounds like a superb pastry dough and I love all of your creations! Delicious! I do a lot of cooking and love experimenting. I am interested like Adam in seeing your Fennel and Cheese Pie as well as anything else that is a little bit different to the normal everyday food. Thankyou for your sharing and informative site.